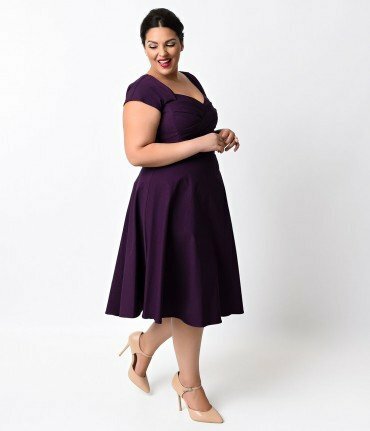 Most overweight women are confused how to dress for their fat body.and we are going to give 6 Plus Size Dressing Tips for big women.wish those tips also can help them reburn to beautiful and fashion women. 1.Try to take dark color party dresses,it can make you look like more slim,works well. 2.Try to take some dislocation on Visual dresses,sunch as choosing dark color on waist part design for sliming fit if you have love handles. 3.Loose T shirt combine with condycon jean is perfect,loose blouse can over your top. 4.Choosing Long cardigan for decoration,it make you fashion not fat. 5.Chiffon dresses make you feel comfortable and no tight,good chooise for fat women. 6.The bat’s-wing-sleeved sweater is special benifit for fat women,it not only cover your extra meat,but also make you more cute and graceful. If you have any good idea for fat girl fashion tips ,please feel free to comment below.you will be highly appreciated. ← Where To Buy Jumpsuits?